Extra History is a series of hisotrical animations (I guess you could call them that) on You Tube. 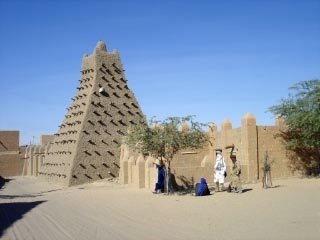 Currently EH is posting material on the 14th century Empire of Mali (roughly today's West African country of Mali) famous as one of the world's chief sources of gold, and the location of Timbuktu. EH is following the travelogue of the footloose Islamic scholar Ibn Battuta, who, if you take him at his word, went from his birthplace in Morocco all the way to China, beating for distance the somewhat later Marco Polo. When I was still teaching I loved talking about Ibn Battuta, whose account gives us a good idea of what Islam meant to people outside the Arabic and Persian-speaking areas of the Middle East. Ibn Battuta had a rather harsh judgement on these relatively new converts. Not up to snuff, he said. But you can also get an idea of the flexibility of Islam in this period, which allowed it to appeal to people who lived in the Sahara, on the Russian steppes, and the islands of the Intian Ocean, to name just a few. This EH series is one of the best of the bunch. See it here. I can't help but point out that Ibn Battuta's Saharan journey took place at exactly the time that the Combat of Thirty v. Thirty.